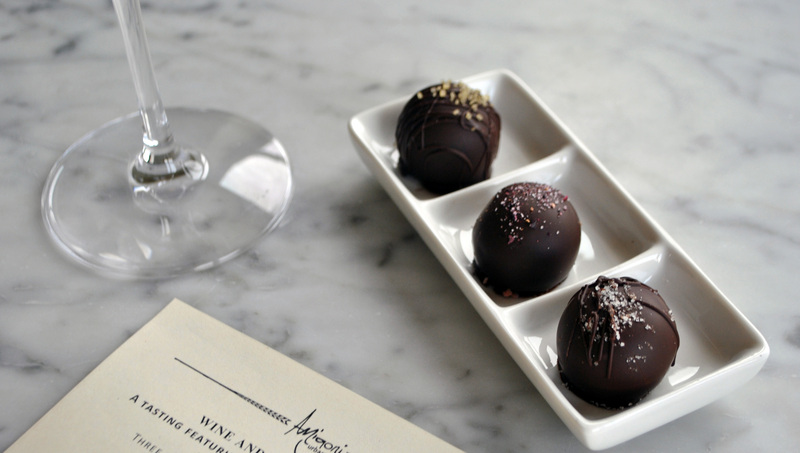 After a great response last year, we teamed up with Panache Chocolatier again to bring you delicious Amigoni wine-infused truffles for Valentine’s Day! Using our Urban Rose, Barbera and Cabernet Franc, the Panache team created rich and luscious chocolates using the finest ingredients and we can’t wait to share them with you! From February 9-18 (excluding Saturdays), we’ll offer Wine and Truffle Flights in the tasting room. You’ll sample each of the three wines along with three matching wine-infused truffles. We’ll also have Amigoni wine-infused truffle gift boxes for your sweetheart! Each box will have two of each flavor, wrapped and ready to give to the wine and chocolate lover in your life. How’s that for stress-free shopping for Valentine’s Day? While we won’t offer the Wine and Truffle Flight on Saturdays, you are welcome to get the gift box and enjoy them while you do your wine tasting! Add one or more bottles of Urban Rose, Barbera or Cabernet Franc and get 10% off the bottles! Our Wine and Truffle Flights are only available for a limited time. Head down to the tasting room to experience this collaboration with Panache Chocolatier!